Like all people with Diabetes I am maintaining a diary for my blood glucose levels. Unfortunately the analysis of my handwritten diary turned out as very time-consuming. In the year 2006 I had the idea to replace my diary with a web site that can be used with my mobile phone. In the mean time this idea evolved to Glucosurfer.org and a small team is already working for the success of this non commercial project. 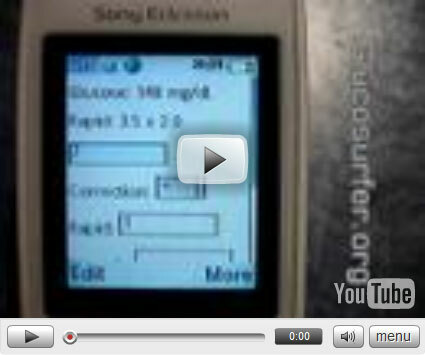 Please click on Demo1 (insulin pen and Libre CGMS) or Demo2 (insulin pump) to experience the benefits of our system. In our ethical guideline we are commiting ourselves to treat your diary with great respect for your privacy. Diabetes is a chronical condition where the patient is in charge of its positive progress. With Diabetes the insulin supply of the body is limited and therefore a central mechanism of the human metabolism is malfunctioning. Under normal circumstances the healthy body has a very sensitive and self-contained system to control the production of insulin which controls the blood glucose level. This control function must be carried out manually by people with Diabetes. They are in full charge of their blood glucose especially when they control their necessary dose of insulin themselfes. Many parameters and experiences must be considered to reach the same quality of metabolic reactions as healthy human beings. This is a fundamental difference to conditions that can be treated with more standardized medical treatments. 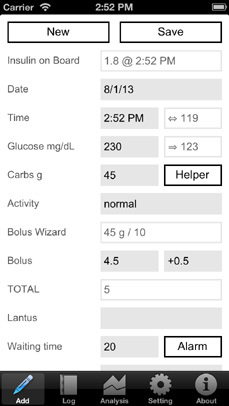 The services of Glucosurfer.org are meant to simplify the treatment of Diabetes. 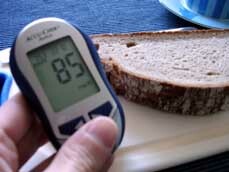 All Diabetics will benefit from extensive documentation of their blood glucose levels. Typically this is done with a handwritten diary. 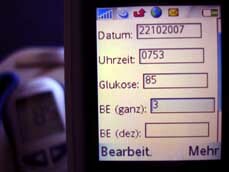 As a result of dilligent blood glucose testing the number of diary entries can be extensive. Thus only few Diabetics bother to feed their diary to computer programs for analysis. By using the handwritten diary as the main source of information it is quite likely that important implications and slow changes will not be identified. We create very usefull visualisations of your diary. There you can see if certain outliers happen systematically. 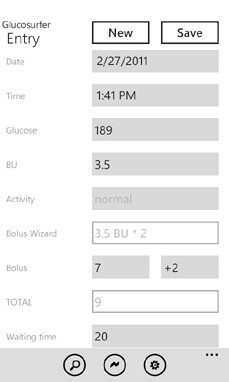 A patient where the midday BU factor is to low will experience higher blood glucose levels in the afternoons. Our diagram "Glucose - Comparison of Days" will enable you to identify these outliers. Therefore you or your diabetologist can think about the cause which will lead to the idea of increasing the midday BU factor. One week later the same diagram will show that the number of outliers has decreased. This fast identification of systematic problems is one of the key benefits of Glucosurfer.org. We designed Glucosurfer.org in a way that allows you to share your diary with others. A share is just a web link that leads others to your diary. You can use these links in e-mails or postings to newsgroups like alt.support.diabetes or TuDiabetes.org. Your community will take a look at your diary and perhaps you will receive the right advice to solve your problem. This is the positive community experience that we are aiming at. Our services are in daily use for more than a year now. All the participating Diabetics could improve their blood glucose levels. The proportion of blood glucose levels higher than 200 mg/dL has been reduced - for some patients significantly. Furthermore the proportion of levels between 140 and 200 mg/dL has decreased whereas the levels below 60 mg/dL have only slightly increased. This positive development is reflected by the HbA1c which improved at an average of 0.2. This is an remarkable achievement for Diabetics with good blood glucose control. Your diary data is maintained in an anonymous state. Therefore it can be used for the Diabetes research if you are willing to participate. The Institute for Diabetes Research at the St. Franziskus-Hospital in Münster will use your long term data to improve the treatment of Diabetes. If you work in the research field do not hesitate to contact the Institute for cooperation. The core functionality has already been implemented. We would like to invite you sincerely to use our service in your daily activity. You can follow the evolution of this projekt through our Blog. There you can give your feedback about problems or enhancements by posting a comment there. Furthermore you can contact us straightforward via e-mail. Despite of your annonymity you should always communicate via SSL encrypted communication. For this purpose we use SSL certificates of the certification authority RapidSSL. Most browsers already accept this certification authority and will allow encrypted communication. The following paragraphs about the legal conditions of using this service are necessary to protect our service. You must accept these conditions to continue with the use of the service. Thank you for your understanding. THERE IS NO WARRANTY FOR THE WEB SERVICE, TO THE EXTENT PERMITTED BY APPLICABLE LAW. THE COPYRIGHT HOLDER PROVIDES THE WEB SERVICE “AS IS” WITHOUT WARRANTY OF ANY KIND, EITHER EXPRESSED OR IMPLIED, INCLUDING, BUT NOT LIMITED TO, THE IMPLIED WARRANTIES OF MERCHANTABILITY AND FITNESS FOR A PARTICULAR PURPOSE. THE ENTIRE RISK AS TO THE QUALITY AND PERFORMANCE OF THE WEB SERVICE IS WITH YOU. SHOULD THE WEB SERVICE PROVE DEFECTIVE, YOU ASSUME THE CONSEQUENCES OF ALL EMERGING SIDE EFFECTS. IN NO EVENT UNLESS REQUIRED BY APPLICABLE LAW WILL THE COPYRIGHT HOLDER BE LIABLE TO YOU FOR DAMAGES, INCLUDING ANY GENERAL, SPECIAL, INCIDENTAL OR CONSEQUENTIAL DAMAGES ARISING OUT OF THE USE OR INABILITY TO USE THE WEB SERVICE (INCLUDING BUT NOT LIMITED TO LOSS OF DATA OR DATA BEING RENDERED INACCURATE OR LOSSES SUSTAINED BY YOU OR THIRD PARTIES OR A FAILURE OF THE WEB SERVICE TO OPERATE WITH ANY OTHER SERVICES), EVEN IF THE HOLDER HAS BEEN ADVISED OF THE POSSIBILITY OF SUCH DAMAGES.